A security guard has been confirmed killed and 20 people wounded. The mother of a female journalist at the station told the BBC she had received no news of her daughter, hours after the attack. One of the news presenters, with his hand bandaged from cutting himself on broken glass, gave details of the assault to viewers. "We have all come back [to work], all our journalists and colleagues are back on duty," he said. "This is an attack on freedom of media but they cannot silence us," the station's news director Abid Ehsas told another outlet, Tolo News. Shamshad TV broadcasts a wide variety of programmes including news and current affairs in the Pashto language. It is one of the BBC's partner stations. 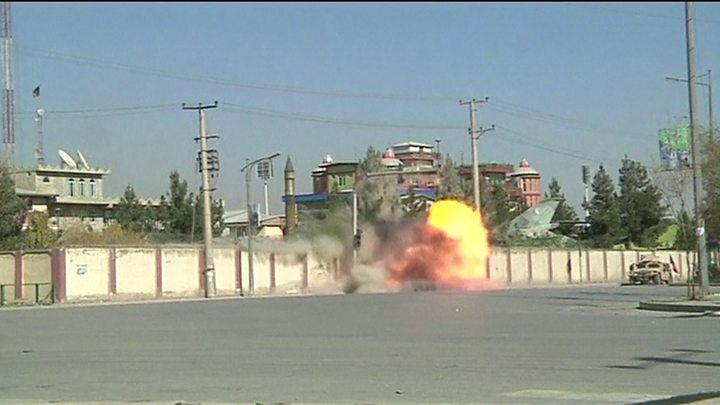 Kabul has been targeted repeatedly in recent months by the Taliban and IS. Afghanistan is one of the world's most dangerous countries for journalists and media workers.